But the more you listen the more sense it makes. 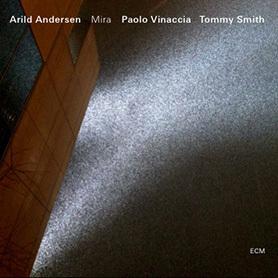 Arild Andersen chose six songs associated with the ECM label, and commissioned six different arrangers to create new charts for the Scottish National Jazz Orchestra under the direction of Tommy Smith. Andersen, on bass, is the featured soloist. The concert was recorded in Stevenson Hall at the Royal Conservatoire of Scotland in October 2010. Most of these pieces began life as small-group music. It is revelatory to hear them elaborated and magnified for a large orchestra, and to hear all previous solo voices amalgamated into one. Andersen is eloquent and flowing and endlessly suggestive. In Makoto Ozone’s arrangement, Chick Corea’s “Crystal Silence” reveals new layers. Its familiar two-note call shifts in color every time it is restated by a different section of the ensemble. When the orchestral details and embellishments subside, Andersen’s bass is suddenly there, picking out the theme with slow solemnity. Among living bassists, Andersen shares a quality with Charlie Haden. He can pluck one note and hang it in the air and make it resonate with human pathos. Keith Jarrett’s “My Song,” arranged by Geoffrey Keezer, initially sounds like itself because its bright, delicate melodic incantation is introduced on piano. But then Andersen’s bass takes it into another dark language. Tommy Smith solos briefly. He is a powerful tenor saxophonist who limits his solo role on this album to a few compelling interjections. On his own rapt arrangement of Jan Garbarek’s “Molde Canticle,” he comes in on top of Andersen’s bass and escalates the ritual. Celebration is atypically accessible and seductive.